Mt. 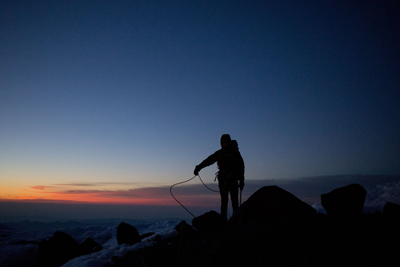 Rainier is one of America’s premier climbing destinations and the perfect training ground for future mountaineering expeditions around the world. Reaching to a height of 14,410 feet, Mt. 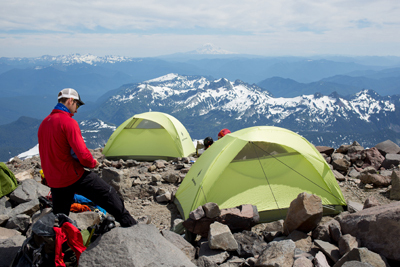 Rainier gives you a full on mountaineering experience. Our program is five days. We start at Paradise Visitor Center and ascend via Disappointment Cleaver - with two days of mountaineering skills built in. This allows beginners to gain confidence and seasoned climbers a chance to refresh all while acclimatizing to the altitude. Most importantly, it allows time to truly appreciate and enjoy the experience. 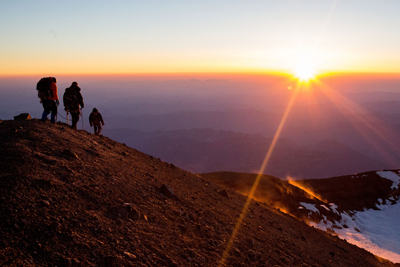 If you are looking to test your strength and have a big mountain experience, we encourage you to join us on our climb to the roof of the Northwest. Pending the climbing permit, dates will be posted asap. Day 2: Today, plan to arrive in Ashford, WA by 1:30PM at the latest. We will meet at 2PM at our hotel. Here we will meet and greet our fellow teammates and get a briefing of what to expect for the next 3 days. Following this meeting, we will conduct a full gear check to ensure everyone has what they need to complete the climb safely and efficiently. We will have the opportunity to rent or purchase any missing gear. Overnight Accommodations in Ashford are included. Day 3: We will have a team breakfast and begin our 30-minute scenic drive to Paradise at 5,400ft. This is the jumping off point for many Mt. Rainier climbing teams. We will spend the day with a 1-2 hour hike to 7500ft where we will practice mountaineering skills such as crampon technique, self arrest, basic knots and roped travel. These skills will be paramount during our climb. We will then descend and spend the night in Ashford. Overnight accommodations are included. Day 4: An early start will see us back to Paradise and beginning our climb by 9AM. We will ascend through lush greenery and wildflowers until we hit the Muir Snowfield. Another few hours of climbing will put us at 9,500ft and our home for the night. Day 5: We will start today with a casual start followed by a short climb to 11,000ft. This will be our first introduction to glacier travel as we cross the Cowlitz Glacier on our way to our camp on the Ingraham Glacier. Day 6: We have a "rest day" today but we will take advantage of it. We will have the opportunity to learn crevasse rescue. If interested, you will have the opportunity to be lowered into a real crevasse and then pulled out. We will head to bed before sunset as we will have an alpine start the following morning. Day 7: Our climb to the summit begins very early and takes us across the Ingraham Glacier at night and then onto Disappointment Cleaver. The cleaver gives us access to the upper mountain, which is absolutely stunning. We will experience what it is like to walk under towering seracs, cross large crevasses and photograph breathtaking views of Seattle, Puget Sound and countless Cascade mountains. 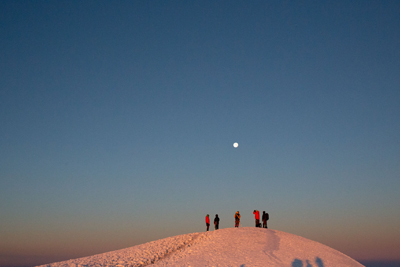 We aim to summit around sunrise. If the weather is good, we will enjoy up to an hour on the summit before the long descent. Once back in camp, we will relax for a couple of hours before packing up and descending to Paradise and a hot meal. We recommend booking a hotel in Ashford for the overnight. How Difficult is a Mt. Rainier Climb? Mt. 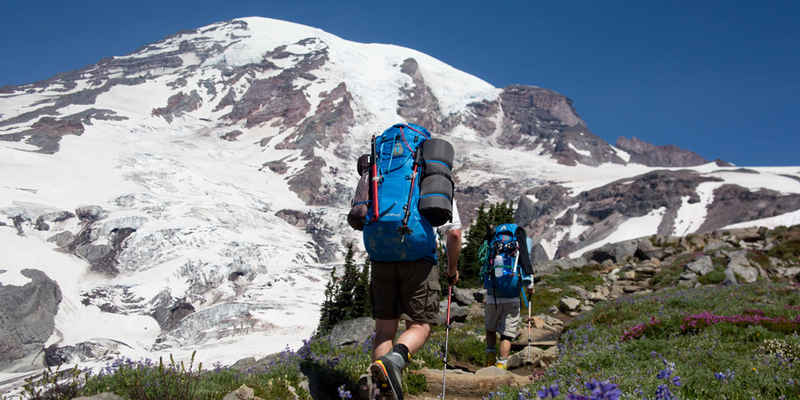 Rainier is a long climb with heavy backpacks. It can be very strenuous at times. Although it is not a technical peak and only requires travel on moderate snow slopes the weight of your backpack, the length of the days and the high altitude all take a toll on you. You will need to be in top physical condition. You should have previous backpacking experience. We included two days of mountaineering skills for participants to learn or refresh on crampons techniques, rope team travel, self arrest and crevasse rescue. Participants should be in top physical shape with prior hiking experience. We encourage participants to be age 16 or over, although exceptions can be made based on previous experience. Participants under the age of 16 will need to submit a climbing resume for review. As long as you are in excellent physical condition, are approved by your doctor, and are able to legally sign the liability waiver, you are welcome to join us!